Boldon goalkeeper Ryan Graham tips an effort onto the post. 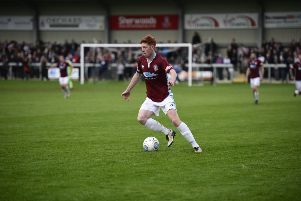 Gavin Cogdon returned to action with a bang as his first half hat-trick helped to fire a young South Shields team to victory in the Sam Bartram Cup last night. Cogdon made his first appearance of pre-season in the match against Boldon CA and marked it with three goals before being substituted before half-time. An own goal had given Shields the lead and academy prospect Max Cowburn made it five in the second half before the hosts pulled one back. 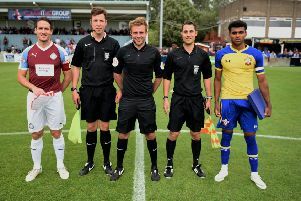 The Mariners fielded a team mostly made up of academy players, although first-teamers Robert Briggs, Gary Brown, Josh Gillies and Cogdon were among the starting 11. They ended the match with a team entirely made up of teenagers, but Shields had far too much for the Wearside League side. They twice went close early on, with Dan Lowther seeing an effort tipped over by Boldon goalkeeper Ryan Graham, who also denied Cogdon. However, he was beaten by his own defender, Johnny O’Brien, in the fourth minute as he spectacularly hooked a cross from the right into his own net. Lowther almost made it two moments later, but his curled effort went just past the post. The Mariners were dominant in possession and added a deserved second goal when Briggs was played in on the right of the box and moved the ball inside for Cogdon, who dinked it past Graham. Arron Thompson was the next to go close as Graham brilliantly denied him, but he could do nothing to prevent Cogdon notching his second when Gillies played the ball to the frontman, who thundered in an effort via the crossbar from 12 yards. Shields were rampant and Briggs almost forced a fourth goal when he closed down a clearance from Graham, but the ball bounced off him and narrowly wide. Cogdon completed a 16-minute hat-trick to make it 4-0 after an effort from Gillies was parried to him and he kept his composure to rattle it home. He was immediately replaced by Lee Mason after completing a hugely successful return from holiday. Briggs and Lowther both went close before half-time, and Boldon almost pulled one back when Reece McEwan’s low effort was brilliantly tipped wide by goalkeeper Elliot Stephenson. A minute before the break, Briggs hit the post with a low effort from distance as Shields kept up the pressure. Despite making six changes at half-time, the Mariners’ momentum was not halted. Callum Guy forced a smart save out of Graham and Cowburn smashed an effort against the post within the first three minutes of the second half. Bailey Judson and Ollie Scott also threatened a goal, while Mason struck the post after being played in by midfielder Karl Ross. Cowburn and Guy saw further efforts saved by Graham before Cowburn added Shields’ fifth, firing home after Bailey Judson’s ball in from the left fell to his feet. Dan Dunbar pulled a goal back for Boldon six minutes before the end as he headed in a corner from McEwan, but the night - and cup - belonged to the Mariners. SOUTH SHIELDS: Stephenson, Biwer, Cooper (Scott 46), Thompson (Ross 46), Patterson (Bexton 32), Brown (Patterson 61), Allasan (Cowburn 46), Briggs (c) (Orrell 46), Cogdon (Mason 37) (M Colquhoun 68), Lowther (Guy 46), Gillies (Judson 46). Goals: O’Brien own goal (4), Cogdon (20, 25, 36), Cowburn (78).